Hide the boring pagination and automatically load products and search results when user scrolls down the page. Or, enable manual trigger, and have only one button for more products! Supports Browser Back and Layered navigation! replace boring and unfriendly paginations, with the Infinite Scroll feature! Just like Facebook, Twitter or touch profiles! Do you like how Twitter or Facebook loads more comments or pages? How user friendly and convenient that is? Well we tell you: VERY :) And now you can have that on your webshop! 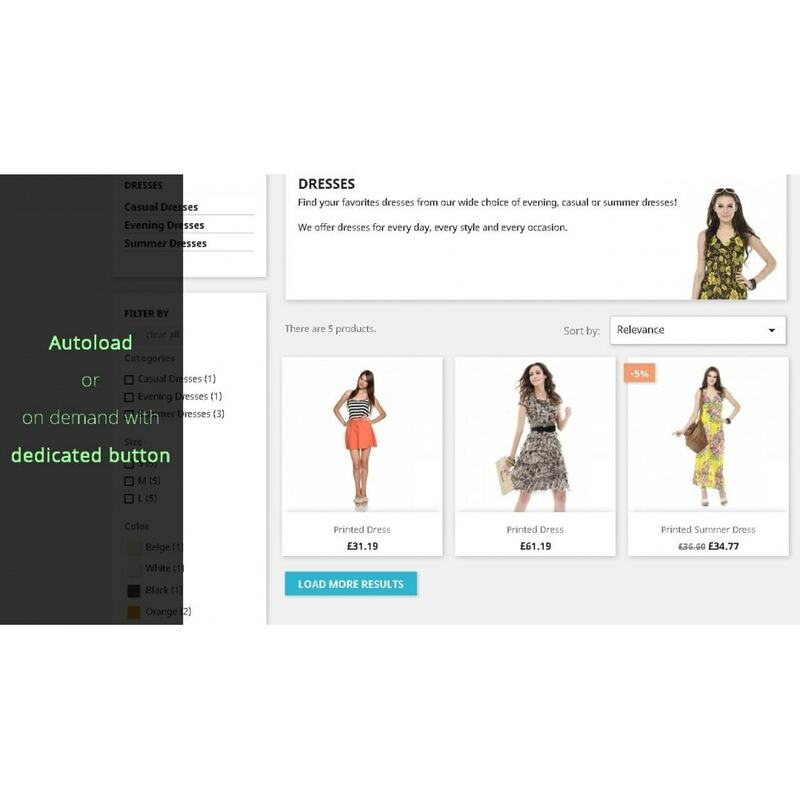 This easy to install, lightweight PrestaShop scrolling plugin will do the job for you! 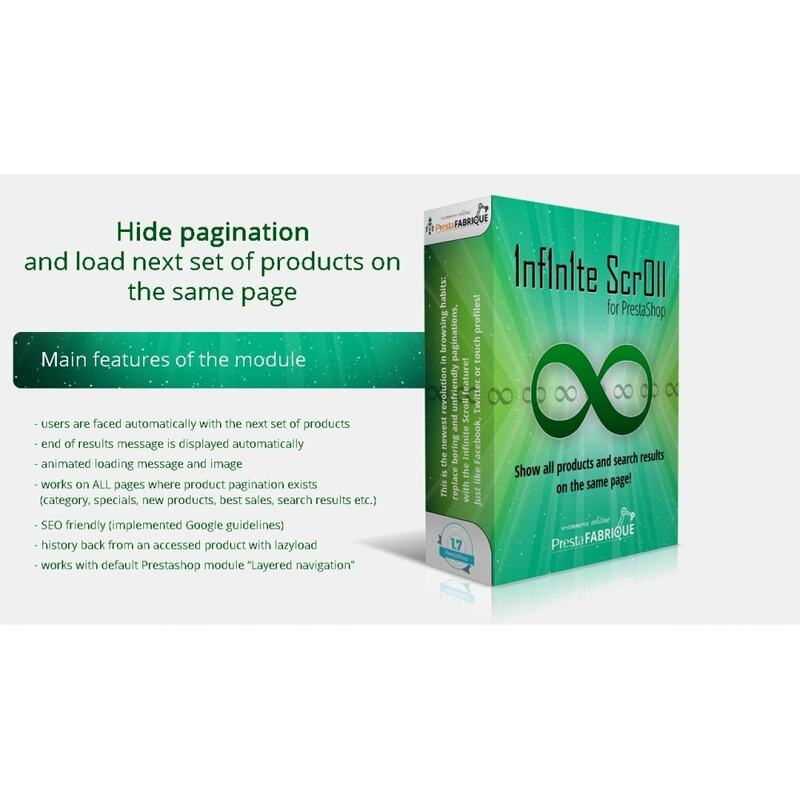 This module will hide pagination (not mandatory / by option) and will automatically load next set of products on the same page without even pressing a button or click the mouse! The method is called infinite scroll, because by default, the loading is done automatically as user scrolls down the page, so they are instantly faced with new products, without even click! However, the option of manual advance also exists, making this load action not so offencing as with scroll. Make sure you configure the module according to your theme's paginate and listing classnames and ID's! Watch the video tutorial linked on the module's config page!